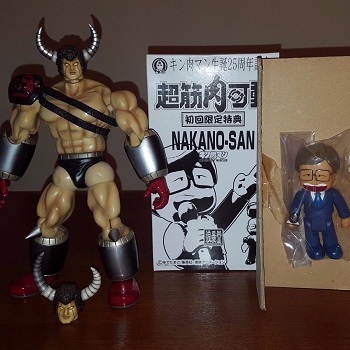 Last week I was curious about the Buffaloman and Nakano-San Romando figures. The $19.99 opening bid captured my attention because many sellers demand top dollar for these figures. The figure set ended up selling for $32.02. I was blown away. That final price is much lower than I could have ever expected. Recently I’ve talked about M.U.S.C.L.E. prices and that we might be in the twilight of M.U.S.C.L.E. collecting. The Buffaloman Romando and the first auction of AW #195 reinforce my feelings, but create a tweak in my overall perception. The first auction, M.U.S.C.L.E. Men Red Figure 1980s Rare, is for a single Red #28 figure. It starts at only one penny and offers free shipping. This could be the best test of the actual price/value of a single M.U.S.C.L.E. figure. I love the idea so much it makes me want to do it for Auction Watch #200. After Auction Watch #100 I feel like I should try something special at #200 too. Moving past AW #200, why does this single figure and Buffaloman Romando tweak my perception? I continue to believe we are in a brutal bottleneck and that M.U.S.C.L.E. collecting is beginning its decline. However, the “tweak” is that value of M.U.S.C.L.E. items has fallen more than anyone could have imagined. The high-priced BIN culture that has created the bottleneck can be reinforced by less than a handful of overzealous collectors. In fact, one collector alone could unintentionally keep the prices falsely propped up. I learned that the Buffaloman set originally sold for around $100. Last week it sold for nearly 70% less than its original price. Will this single M.U.S.C.L.E. figure also sell for less than we would expect (assuming we all agree the price of a single figure is $0.50 to $0.75)? I believe the answer to that question is yes. The bottleneck, the MRT, and the new BIN culture will keep the illusion that M.U.S.C.L.E. prices and collecting are as healthy as ever. The occasional legitimately good auction will help fan that flame too. The sellers brave enough (or, to some, foolish enough) to start with low opening bids paint a vastly different picture. M.U.S.C.L.E. collecting is in a very bad place and the glimmers of hope are far and few between. Does that all seem too melodramatic? Consider the second auction, Vintage 80s Monster Wrestler Alien Figures. M.U.S.C.L.E., as another clear indicator of trouble. At first glance it looks like a lot of eight nice counterfeit figures. The $15 BIN seems high, but the listing also included the option to make an offer. The problem is that most M.U.S.C.L.E. 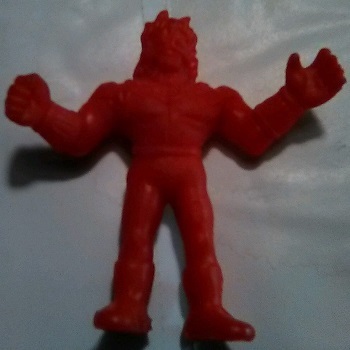 collectors consider these types of counterfeit figures to be small footnotes in the large book of M.U.S.C.L.E. collecting. Adding one or two examples tends to be enough for most collectors. And for the handful of passionate counterfeit collectors they know the figures are easy to find and are never valued at more than a few cents. There is a limited audience for this lot of figures. And the remaining audience would likely pay around four or five dollars. It is very unlikely that the seller would take a 73% reduction in price. The third auction, Vintage M.U.S.C.L.E. MEN (Lot of 42) Loose Used, was originally selected for spotlighting because it was an even larger lot of overpriced counterfeit figures. The BIN of $39.99 seemed ludicrous for a lot of counterfeit figures. Then I clicked on the picture. They were not counterfeit figures. They were badly damaged Flesh M.U.S.C.L.E. figures. They had been colored with paint and/or markers. The lot shifted from a ridiculous overpriced lot to a sad representation of the current state of the hobby. The price of M.U.S.C.L.E. figures will always be hotly contested. 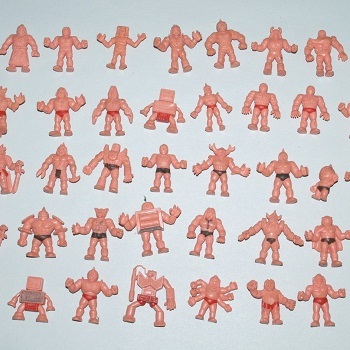 It is a steady as a Purple #208 figure showing up in a lot of Color M.U.S.C.L.E. figures. 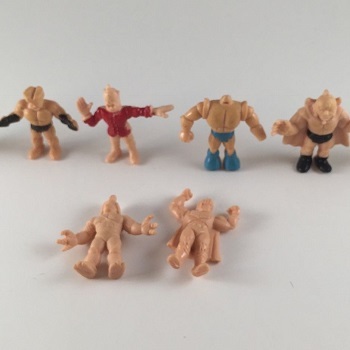 But if sellers, and potential sellers, ever had any love for the M.U.S.C.L.E. community, then try not to hammer a nail in the coffin as you leave the hobby or minimize your collection. This isn’t a request to go “back to the good old days.” This is a request to try and keep the hobby alive. It doesn’t require everyone to do it, just enough to keep figures flowing into the hands of new collectors. This entry was posted on Wednesday, November 9th, 2016 and is filed under Auction Watch. You can follow any responses to this entry through RSS 2.0. You can skip to the end and leave a response. Pinging is currently not allowed. I’m happy that I started to re-collect about a year and half ago, just before things got out-of-hand with prices. Within a number of months I was able to acquire a full flesh set (w/ Satan Cross), a near-mint unpunched 4-pack, a near-mint Hard Knockin’ Ring, and a board game in good condition. I got all of this for good to very good prices. I believe if I decided to start collecting today I would quickly become discouraged and give up. 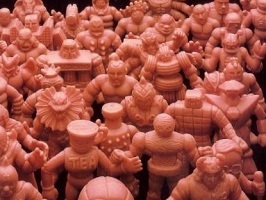 Perhaps sellers realize this might be their last chance to make any money on m.u.s.c.l.e. so they’re trying to squeeze higher prices out of buyers? Hi there, I’m the seller of the Buffaloman/Nakano-San set. I appreciate that you highlighted it on your site. I, too, was blown away by how low the set went for. Maybe the low opening bid was a mistake, although this auction was kind of a test for me. I previously sold a lot of six (mostly) Romando figures at a low opening bid that ended at just over $15. These were all less desirable figures, so I wanted to try an auction with rarer figures. I picked a Buffaloman that I decided to sell because I have similar (but slightly different) figures of the character and the Nakano-San since he was a double. I was planning to pare down my Romando collection a little more by selling some figures that just didn’t appeal to me as much, or keeping my favorite versions of characters and selling some of the other representations I have. (I’d like a little more room in my closet. lol) But now I’m very hesitant to sell even figures I’m lukewarm on for so much less than I paid for them. One fact worth nothing is that eBay seemed to be down right around the time the auction ended. I tried to check it on my phone and couldn’t connect to the site for several minutes. There was a reported outage at the time, although I’m not sure it effected all users. The reality of eBay is that many auctions receive multiple bids in the last minutes, and an outage during that time means the seller gets whatever highest bid was in place at the time the auction ended. However, I think it’s more likely that you are correct about M.U.S.C.L.E. and Kinnikuman collecting in the western world petering off. There is no new material coming out here, aside from the Masters of the Universe homage figures, and many fans are getting older and moving on, or have already acquired the items they want. Another factor affecting the Romando figures, I’m sure, is the new Kinnikuman line from SH Figuarts that is arguably better with more articulated figures. These are Japanese toys but you can get them through Amazon and sites like Big Bad Toy Store. Romando are no longer unique. You make another great point about Buy It Now auctions, which had also crossed my mind. When you have rare items, sellers can attempt to control the market by listing high Buy It Now prices. If all the figures available are around the same inflated price, you have to pay that or have nothing at all. (Often this is influenced by what an item sold for at some point in the past.) But when a rare item enters eBay at a low opening bid, the buyers determine and reveal the actual value. At the end of the day, I’m not broken up about this because I know someone is getting some great Kinnikuman figures and I hope they will enjoy them. It’s a pleasure to share the hobby. But as I stated, I’m very hesitant to list any more Romando figures. Maybe the answer is to start with a higher opening bid and hope for the best, or relist it until it sells, or use BIN. But I’m not sure if that reflects the current market for these toys. Ebay is not the best option for this. I also think the end price was about right as every Nakano-San I have seen in Japan sells for roughly $15 US packaged and the Buffaloman about $25 packaged – the Buffaloman here was loose. Plus, they are not tough to find figures in that line. I counted 9 Buffaloman & 3 Nakano-San Romando figures on Yahoo Japan right now. The other thing about Romando is that there are about 20% in my estimation that are poorly made, even though these particular 2 were well made by Romando standards, casual collectors would probably not know that and possibly only heard the quality is poor.